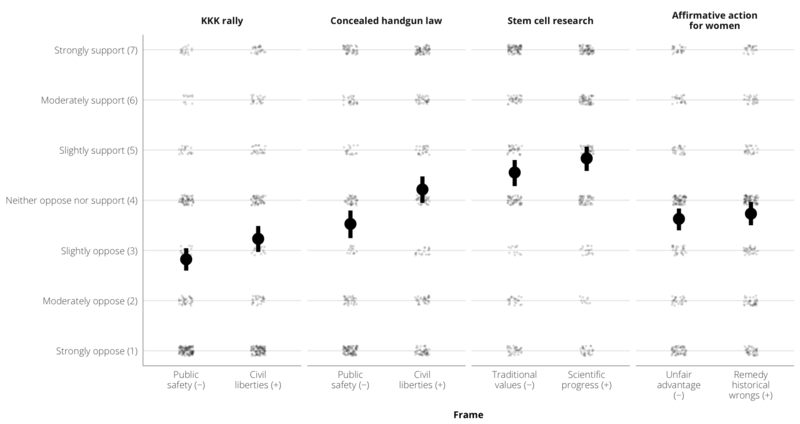 caption <- "Framing effects for various issues"
Notes: “Mean” table entries are average responses, where minimum response is 1, and maximum response is 7, where 7 is maximum support. KKK rally: In general, do you oppose or support allowing members of the Ku Klux Klan to hold public rallies? Concealed handgun law: How strongly do you support or oppose a proposed state law allowing citizens to carry concealed handguns? Stem cell research: How strongly do you oppose or support embryonic stem cell research? Affirmative action for women: Do you oppose or support preferential hiring and promotion of women?